If you are writing an application targeted at large numbers of users, you can optionally use web identity federation for authentication and authorization. Web identity federation removes the need for creating individual IAM users; instead, users can sign in to an identity provider and then obtain temporary security credentials from AWS Security Token Service (AWS STS). The app can then use these credentials to access AWS services. The Web Identity Federation Playground is an interactive website that lets you walk through the process of authenticating via Login with Amazon, Facebook, or Google, getting temporary security credentials, and then using those credentials to make a request to AWS. The entry Web Identity Federation using the AWS SDK for .NET on the AWS .NET Development blog walks through how to use web identity federation with Facebook and includes code snippets in C# that show how to assume an IAM role with web identity and how to use temporary security credentials to access an AWS resource. The AWS SDK for iOS and the AWS SDK for Android contain sample apps. These apps include code that shows how to invoke the identity providers, and then how to use the information from these providers to get and use temporary security credentials. The article Web Identity Federation with Mobile Applications discusses web identity federation and shows an example of how to use web identity federation to access an AWS resource. Now suppose that a mobile gaming app uses this table, and that app needs to support thousands, or even millions, of users. At this scale, it becomes very difficult to manage individual app users, and to guarantee that each user can only access their own data in the GameScores table. Fortunately, many users already have accounts with a third-party identity provider, such as Facebook, Google, or Login with Amazon — so it makes sense to leverage one of these providers for authentication tasks. To do this using web identity federation, the app developer must register the app with an identity provider (such as Login with Amazon) and obtain a unique app ID. Next, the developer needs to create an IAM role. (For this example, we will give this role a name of GameRole.) The role must have an IAM policy document attached to it, specifying the conditions under which the app can access GameScores table. When a user want to play a game, he signs in to his Login with Amazon account from within the gaming app. 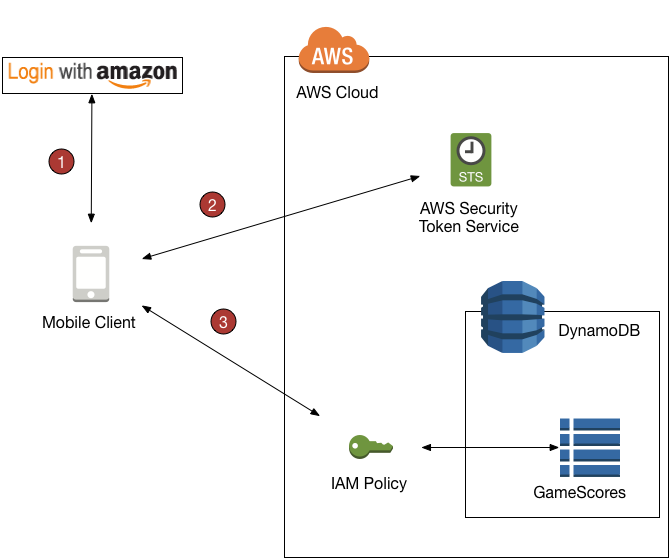 The app then calls AWS Security Token Service (AWS STS), providing the Login with Amazon app ID and requesting membership in GameRole. AWS STS returns temporary AWS credentials to the app and allows it to access the GameScores table, subject to the GameRole policy document. The following diagram shows how these pieces fit together. The app calls a third-party identity provider to authenticate the user and the app. The identity provider returns a web identity token to the app. The app calls AWS STS and passes the web identity token as input. AWS STS authorizes the app and gives it temporary AWS access credentials. The app is allowed to assume an IAM role (GameRole) and access AWS resources in accordance with the role's security policy. The app calls DynamoDB to access the GameScores table. Because it has assumed the GameRole, the app is subject to the security policy associated with that role. The policy document prevents the app from accessing data that does not belong to the user. The Condition clause determines which items in GameScores are visible to the app. It does this by comparing the Login with Amazon ID to the UserId partition key values in GameScores. Only the items belonging to the current user can be processed using one of DynamoDB actions that are listed in this policy—other items in the table cannot be accessed. Furthermore, only the specific attributes listed in the policy can be accessed.